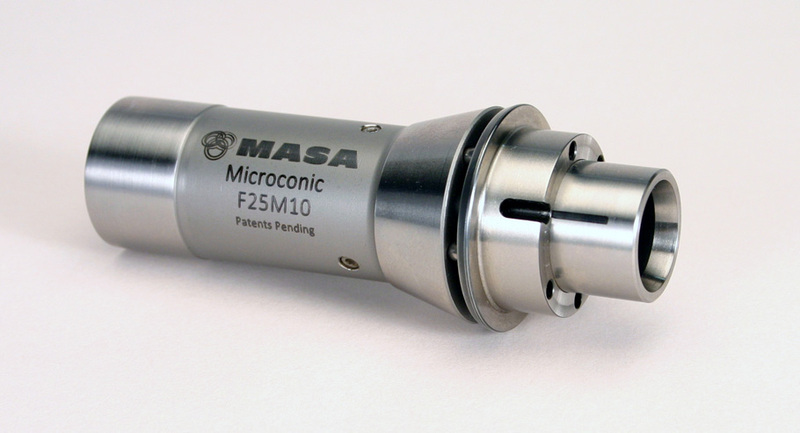 The Microconic™ cartridge fits into your CNC lathe or swiss machine and transforms the spindle into a highly accurate miniature work holding system. Installing the Microconic cartrdige enables your shop to convert all of your facilities turning machines spindles to a one universally sized Microconic collet for your small diameter workholding. All cartridges are precision groundhigh-chromium tool steel. Our manufacturing tolerance is 3µm (.0001") and we guarantee our cartridges to be within 5µm (0.0002") in production use in your machine . The robust design and materials ensure reliability and longevity in the most demanding production environment, while providing extreme accuracy. Installed like a standard collet in your machine, and actuated like a normal collet. No modifications of the machine are necessary. For both draw-type collet systems, like 5C &16C, and push-type "dead length" systems, such as TF16, TF20, TF25 & TF37. NOW you can move production operations to the sub-spindle of from the main in your CNC lathes to equalize out cutting time. Micrograd™ adjustment face dial wrench give you precise & repeatable control of collet clamping pressure. This is unique to our system! Delicate parts are held firmly and precisely, every time. Designed with an extended nose that is solid and rigid, yet small in diameter so tooling and coolant have easy access to workpiece. Designed to eliminate the need for extended nose collets. Superior in concentricity, rigidity, and gripping force than standard collets & emergency collets. Solid extended nose for unsurpassed rigidity. Micrograd™ adjust control of collet closure; even the most fragile parts can be held safely and firmly. Extreme accuracy. Concentricity typically within 5 microns (.0002") runnout. The F25 Cartridge is the basis of the Microconic work holding system. 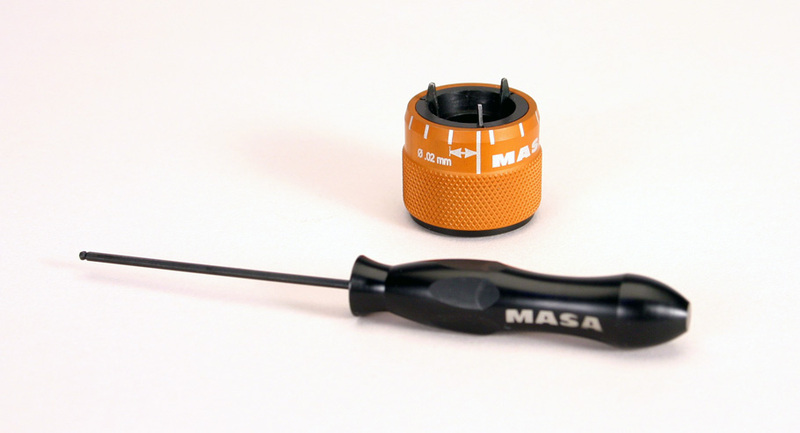 Solid extended nose, giving superior access for tooling with minimal overhang while maintaining 5 µm/.0002" concentricity. 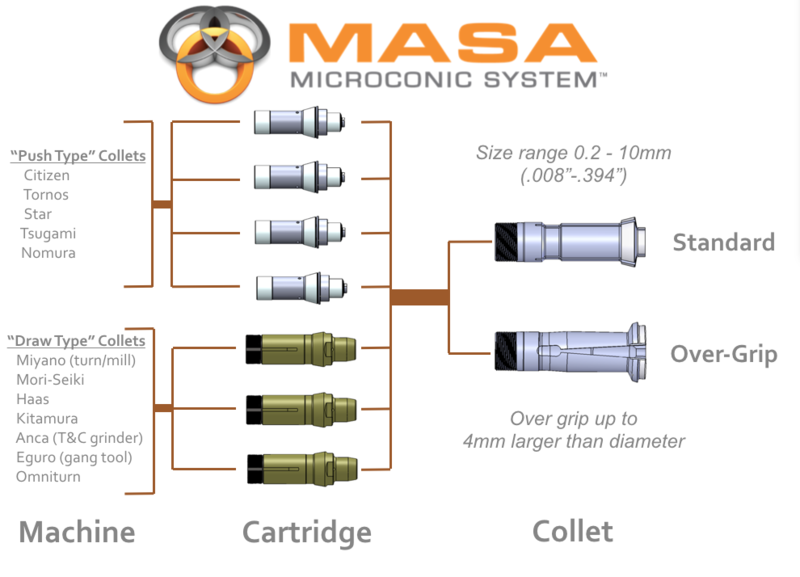 If you have any secondary gang-tool or turret lathes with 5C collet system you will LOVE the Microconic 5CM10 cartridge. Better tool clearance with the extended nose. 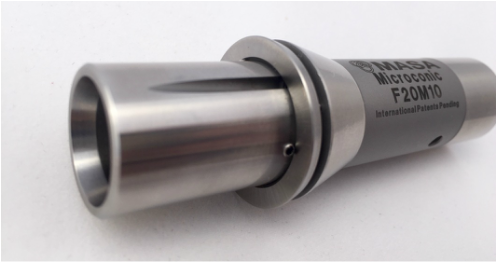 Micrometer control of collet closure regardless of hydraulic/pneumatic/manual collet closing mechanism of the machine. Unbeatable concentricity. 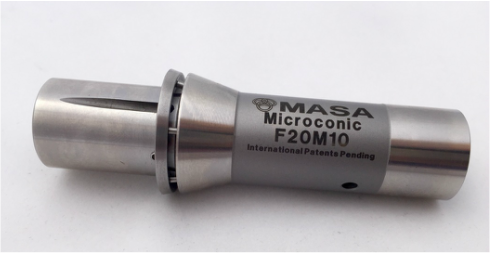 The Micrograd™ Graduated Collet Wrench provides a method of precisely setting clamping pressure on both the Microconic collets and an Microconic overgrip collets . It can be adjusted in metric increments of 0,02mm and imperial increments of .001"
Please see our installation procedures for more details on how to set up and replicate your clamping pressure on every machine in your shop.